What’s Behind the ‘Poor Door’? Inclusionary zoning laws are among the few tools left to ensure the creation of affordable housing. Three and a half years ago, after living for more than a quarter-century in a rent-stabilized apartment in a ratty Greenwich Village tenement, my wife and I moved to a condo in downtown Manhattan. Conscientious ’60s veterans, we felt some anxiety about landing in the climes of privilege—honey, property is theft—but we got over it fast. This was cemented shortly after our arrival, when we were asked to weigh in on a pressing matter. At the time our building—formerly offices—was originally converted, it had three separate entrances: one for commercial space on the lower floors, another for rental apartments in the middle, and the last for the condos at the top. The rentals had been fairly quickly made into condos, and the question to be decided was whether the two residential lobbies should be combined into one, with potential savings on staff and electricity, and the possible production of new commercial space. There was a catch: the wait for elevators would be fractionally longer, and the mail—which hitherto had been collected behind the front desk and delivered by hand—would be stuffed into standard mailboxes. There were other unspoken objections, such as sharing an elevator with residents of the formerly rental condos, which were a bit smaller than the original batch and were, of course, on floors lower down. A strong whiff of class and privilege was in the air, and our neighbors voiced concern about property values, if only under the guise of “reduced services” and “inconvenience.” For our part, we were disturbed that, after finally reaching real estate nirvana, our sumptuary delights (being actually handed the junk mail, a garbage room on every floor, riding an elevator!) were about to be snatched away. We voted no, along with almost everyone else. There was a loud outcry this fall over a proposal by Extell for a tower at 40 Riverside Boulevard (currently under construction). It is a sorry-looking lump—with fabulous views—at the end of a long row of sorry-looking lumps along the Hudson River built by Donald Trump below 72nd Street. Like several buildings on the East River waterfront in Brooklyn (including the Toll Brothers Northside Piers), the building is divided into distinct affordable and market sections, each with its own entrance. The uproar was considerable, not least because the symbolism of those double doors was galling to what one might think of as the predominant sensibility on the good old Upper West Side, and plenty of politicians piled on. Still, the question must be approached conscientiously, as this clarity of division has long been the medium of both official policy and the general expectation of the culture, and nobody has offered a clear theory of either the value or the measure of such structured propinquity. My own first years as a permanent resident in the city coincided with the build-out of the Upper West Side urban renewal area, first envisioned in 1955. It was the product, in part, of an infusion of federal funds and a nominally liberal idea about the way in which economic difference was to be sorted. There had been massive demolition of “substandard” housing and much new construction aimed primarily at middle-class residents (to counter the much-whispered fear of “white flight”). But there was some public housing in the mix as well as the retention of large areas of existing New York City Housing Authority projects, which had been built not so long before as part of the Moses-era vision of sweeping “slum” clearance and the construction of large, carceral complexes for the poor. Setting aside familiar arguments about urban renewal, the results retain a certain psychic influence over our paradigms of mix. Within a relatively small compass there was wealth along the park, and large complexes for middle- and lower-income citizens off the park, including scattered sites for buildings devoted to each. Moreover, in those days, the number of rent-regulated units in the neighborhood remained high. Some form of differential rent regulation is surely the most effective way to guarantee both affordability and mix in housing, although there is not a successful formulation for harmonizing rent controls with the appropriate incentives to encourage construction by the private sector to accommodate these tenants—to ensure that they will not, in effect, be segregated. This has been the experience with the Section 8 voucher program, often offered inadequately as redress for the demolition of existing public housing but tending to reinforce existing patterns of segregation. There is no coherent national consensus about housing as a right, and few politicians are willing to describe it, at best, as anything more than a general good (like health, education or sound nutrition). If we concede that the market is not a system that makes equality its first priority, then we must interfere with it in some way to produce equitable results. The idea of a distributive ethics in the city requires a distributive planning process that embraces not simply use—planning’s traditional interest—but social access. The crunch comes when questions of the allocation of social goods are entertained in the realm of space. For example, there has been an ongoing evolution in ideas about the provision and location of “social” housing that has yielded very different results at different times and in different places. In Vienna (a particularly instructive example), 60 percent of residents currently live in municipally built housing, which is directed mainly toward the middle class. During its socialist heyday in the ’20s and early ’30s, the city built gorgeous housing for nearly a quarter-million members of the working class in the “Red Ring.” In New York, from the nineteenth century to the present day, we have been caught up in a debate that dilutes its focus over four strategies: the remediation in place, the construction of large and concentrated new developments, the scattering of new affordable housing, and the distribution of subsidies via vouchers or rent regulations to allow existing systems of housing production to be more welcoming and useful to those whose resources can not meet the market rate. As a rule, New Yorkers seem to have far more tolerance for well-motivated forms of “inequality” than might be expected. On the one hand, our huge income gap doesn’t seem to be stirring much insurrectionary rage. On the other, the better-off accept more quotidian forms of tolerance—as can be seen, for instance, among those living in buildings that charge wildly disparate amounts for identical rent-regulated apartments. (In our tenement, I was occasionally sent the rent bill for a next-door neighbor, who paid a quarter of what we did, and I suffered no ill effects.) Nor do Americans more generally appear unable to deal with their banked rage at, say, the other passengers in Row 38 on United Airlines, all of whom are traveling at insanely varying fares. It does seem clear that such circumstances do not, in general, exceed our psychical capacities, suggesting that we are able to accept as “normal” a certain scale of distributive redress as a cure for larger inequalities, as well as to tolerate the inequalities themselves. Indeed, in a city in which the richest census tract and the poorest are just a few miles apart, the lack of revolutionary discontent at this spectacle of inequality is both remarkable and symptomatic. What is seldom discussed openly is that inclusionary housing programs are measures for integration, a word largely retired from our ethical and political vocabulary, and no policy can succeed until this value is openly acknowledged. It’s certainly striking that talk of “mixing”—of classes, ethnicities, races—is seldom honored explicitly as an objective for policy, reduced to the more generic and less nuanced issues of “equity” and “fairness.” But one must speak otherwise in any debate about the future, as the income gap only continues to accelerate. The statistics are indeed grim. A paper from the IMF—recently cited by the New York Times columnist Charles Blow—reported that the share of market income in the United States captured by the richest 10 percent grew from 30 percent in 1980 to 48 percent in 2012, and that the take of the wealthiest 0.1 percent quadrupled from 2.6 percent to 10.4, even as poverty rates have failed to budge for years. In New York, this disparity gets compounded by escalating housing costs. A report by State Comptroller Thomas DiNapoli found that half the renters in the state and more than a third of homeowners devote more than 30 percent of their income to housing, the federal threshold of affordability. As DiNapoli told the Times, “you’ve got households with less money and costs going up.” Like the income gap, the percentage of those who cannot afford housing is rising dramatically, from 40.5 percent in 2000 to 50.6 percent in 2012 for renters and from 26.4 to 33.9 percent over the same period for owners. The crisis is not simply limited to the city. DiNapoli found that while 57.6 percent of renters in the Bronx were paying more than they could afford, so were at least 54 percent of those in Greene, Ulster, Rockland and Orange counties. Given the retreat of the public sector from the business of building housing, the structuring of inducements for private developers and a staunch defense of rent regulations are increasingly the only ways to guarantee the creation and protection of affordable housing. However, there remains a lively discussion about the respective roles of the carrot and the stick. Under Bloomberg, it was carrots as far as the eye could see, and compliance was entirely voluntary. As Councilman Brad Lander documented in a 2013 report on the results of inclusionary zoning, the outcome has been unimpressive, although better in some locations (notably the West Side) than others. The bottom line, though, is that a total of 2,769 affordable units (amounting to about 13 percent of the total units developed in the designated areas during the period) have been produced since 2005—and if de Blasio is going to generate his promised 200,000 units in the next decade, some other approach is clearly necessary, especially since rent-regulated units are disappearing fast, either as the result of being deregulated once they become vacant, or because of the demolition of the buildings in which they sit (Lander reports that the latter cost the city around 8,000 units between 2005 and 2012). Inclusionary zoning should be made both mandatory and general, a position advocated by Lander and, in his campaign, by de Blasio (who promises details in May), as well as by other community organizations (with leadership from the Association for Neighborhood and Housing Development) and politicians, including Manhattan Borough President Gale Brewer. The first big planning move—and real estate deal—of the de Blasio administration seems to offer a promising sign of commitment to making more energetic use of the program. It concerns the development of the mighty Domino Sugar refinery and a surrounding eleven-acre site in Brooklyn. The project has been in play for a decade, and planning has been controversial from the start. Domino shut down operations in 2004 and sold its property to a developer, the Community Preservation Corporation (and two partners), for $55.8 million. 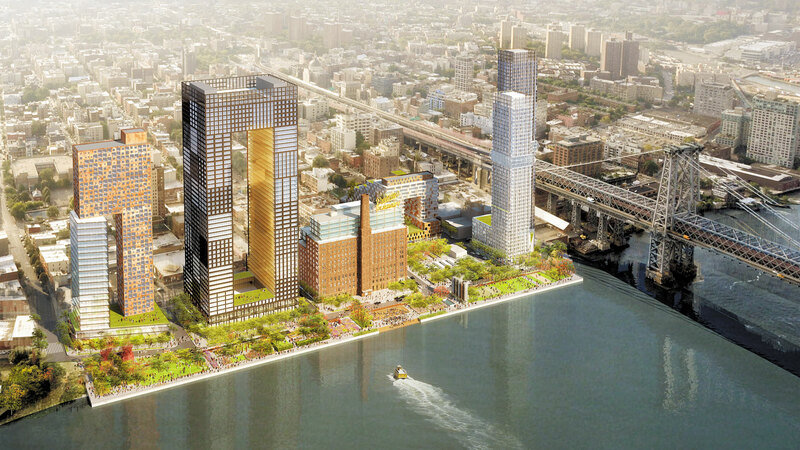 CPC proposed a Rafael Viñoly–designed complex—part of the city’s plan to line the east side of the East River with towers—that would include 2,200 units, of which 660 were to be affordable, distributed in a brace of thirty- to forty-story buildings. Criticism included sentimental protest over the reuse of the hulking industrial building (now landmarked) for purposes less sweet, as well as fear of gentrification pressure on the neighborhoods nearby; strain on the benighted L train and other services by the new population; the long shadows that the forty-story buildings were expected to cast inland; and the likelihood that the proposed waterfront park would be a cut-off preserve. There was also a strong sense that giant buildings flanking the river might not be the most imaginative and productive use of the space. Certainly, 700 affordable units are a good thing, particularly when the deal raises the percentage from the required 20 percent to closer to 30 percent. It appears that there will be substantially more—and more nuanced—park space. The inclusion of additional office space will help with the on-site mix. But the victory could be pyrrhic. There have been suggestions that much of the affordable housing will be sited in the buildings to go up on the inland side of Kent Avenue, the street that runs behind the waterfront row of towers, though the actual strategy for mixing the units has yet to be designed. The buildings themselves, however, are much taller than in the previous scheme, and the architecture—despite the disingenuous insistence that its arch-of-triumph morphologies will admit more light to the cowering low-rise streets behind—is dated, like something bought in a thrift shop in Rotterdam or Shanghai. It also represents de Blasio’s complete acquiescence to the Brooklyn-as-Pudong planning of his predecessor. Transportation will be a big problem; the Williamsburg Bridge will be overshadowed by looming skyscrapers; and, most fundamentally, the survival of the character and ecology of Williamsburg itself will surely be irrevocably compromised—not simply walled off, but overpopulated and deprived by rising values of the accommodating slack that made it so popular, and singular, in the first place. As the de Blasio administration inches forward, I gain confidence in its quantitative intentions regarding planning. But urban quality is more than a numbers game, and we await some signal about the forms of life our streets and buildings and public spaces will support, some idea about design. Seven hundred units isn’t just lipstick on the pig, but the old east bank of the East River—low-rise, industrial, funky, diverse—is probably gone forever, and that’s too bad. A student of mine, who happens to be from Morocco, visited Ground Zero the other day and was appalled to discover that while information brochures were being offered in eight languages, Arabic wasn’t among them. She asked a docent about this and was told that these were simply the top eight languages spoken by visitors to the plaza. No mosque, no Arabic, what next?